Written by Catherine Saxelby on Wednesday, 25 October 2017. Can your daily bread help lower your cholesterol? This is a big claim so I was pleased to be offered the chance to taste-test two little-known loaves of bread and put them through the Foodwatch review system. 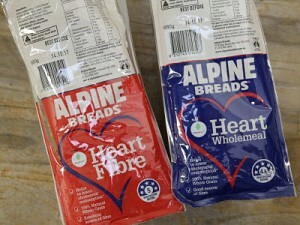 Here’s how we rated these new Alpine Breads sold under the label of Heart Fibre and Heart Wholemeal. This post has been sponsored by by Alpine Breads. I have tasted Alpine Breads before but being based in Sydney, I don’t often spot them at the supermarket. However, these breads are well known in the southern state of Victoria where they’re baked in the small country town of Benalla in the north-east of the state. That said, I finally bought these breads at Coles in Chatswood (a larger supermarket) and can tell you that they are simply delicious with a top taste and aroma. From the moment you peel back the top outer seal, a wonderful wheatiness and maltiness hits you. The key ingredient is the BarleyMax, present as grains (in the Fibre loaf) and as a flour (in the wholemeal loaf). BarleyMax was developed by Australia’s CSIRO and is a grain that’s extra high in fibre and in resistant starch. It has a key component called beta-glucan that blocks the absorption of recirculating cholesterol and so lowers it in the body. There’s plenty of research to show that if you eat 3g of this a day, it helps to lower your blood cholesterol. Great to know it's an Aussie first! I have written about BarleyMax before. Both loaves taste delicious and ‘normal’ if I can use that word. If you didn’t know, you would think they are a standard grainy and wholemeal sliced loaf as there’s nothing to distinguish them from other similar breads. The Heart Fibre grainy loaf tastes hearty and grainy as would any other grain loaf. Both toasted well and made up into sandwiches or toasties nicely. Both teamed well with fillings and toppings, whether savoury (cheese, peanut paste, yeast spread) or sweet (honey, sliced banana). Each slice is a nice thickness, not too thick nor too thin. The texture is substantial but surprisingly light. Both these Alpine Heart breads have an excellent nutrition profile with a positive nutrient density from the flour plus the BarleyMax. This gives them a Health Star Rating (HSR) of 5 out of 5 and 4.5 out of 5 which is pretty good. High in beta-glucan fibre with 1.4 per cent of 1.2g in each serve of two slices. They give you starchy carbs for fuel with important B vitamins to release those carbs into energy once in the body. At 34 per cent, they have lower carbs compared to regular bread which has some 40 per cent. You get 31 grams of carbohydrate packed into one serve of bread (which is two slices). They’re great for fibre, having over 8 per cent fibre (or 8g per serve) to help maintain healthy digestion, add prebiotics and prevent constipation. This is quite impressive, being almost double that of other multigrain loaves and high in the Barleymax fibre for lowering cholesterol absorption. A real winner for me! Both loaves have 12 per cent protein, which is around the same as for a comparable multigrain loaf. You ingest over 10 grams of protein from two slices of normal bread, which is around the same as from two eggs. Modest in sodium or salt with one 360mg per 100g (think of 400mg as a cut-off). Water, bakers flour, BARLEYmax grains, gluten, yeast, vinegar, iodised salt, mineral salt (516), emulsifier (481), enzyme (amylase). Bakers flour is white flour which is not the whole grain flour I like but serves as a stronger ‘base’ to hold the BarleyMax and cracked grains. Mineral salt (516) is calcium sulphate which is used here as a flour treatment agent. In nature, it occurs as gypsum. Industrially it is derived from limestone. It has no known adverse effects. Emulsifier (481) is Sodium Stearoyl Lactylate which is a common bread emulsifier. It’s used to strengthen the dough during mixing and proofing and to keep the crumb soft during storage. Iodised salt is required in all breads (except organic) to help boost the whole population’s intake of iodine which has fallen in recent years. Amylase is an enzyme that kicks off the breakdown of starches. You have it in your saliva so nothing sinister here. Who would this product be suitable for? These breads would be ideal for anyone with high cholesterol. Eaten as part of a low saturated fat diet, they work to block the absorption of cholesterol and boost your intake of fibre, especially soluble and resistant starch. Like all breads, these new Alpine Heart breads are convenient, being ready to eat, can be consumed fresh or toasted, and last well. I found the packaging interesting and different, being a moulded outer pack made of stiff plastic shaped around the rectangular bread which serves to stop the bread becoming squashed and misshapen. Not the usual plastic bag that only makes the bread sweat. Bread is a useful product at home and even if stale has a myriad of end uses from toast to bread puddings such as bread-and-butter custard to breadcrumbs. With bread, there can be no waste which is good. The pack notes that the bread is made in Australia from 100 per cent Australian ingredients which is great to read. So you are supporting Aussie farmers and bakers. The outer thick pack would have to be thrown away in your plastics or in the kitchen waste bin. These are two delicious AND nutritious loaves. There’s NO suffering here. You would never know these are specially formulated for heart health and carry extra Barley Max flour. I’d definitely buy these again and happily serve them or make sandwiches for everyone. Yes it’s best for those with high cholesterol but there’s no reason why others can’t eat it too. Read more about these breads at www.alpinebreads.com.au. Q. Which bran is best – wheat bran or oat bran? 7 reasons whole grains are a MUST! Q. Do psyllium husks lower cholesterol?